I want to talk a little today about photography. I know I haven’t approached the subject in the past. That’s because I’m still learning to shoot food well and don’t feel I have much to offer you yet. Though today, I want to acknowledge something that’s been bugging the hell out of me since my first photography course in 1996. Light. Or supposedly proper light rather. From early on I always liked shots with shadows. I know I’m supposed to do all kinds of stuff to get rid of such atrocities, but I don’t want to. If you look at the above picture you’ll see shadows in the soup, and nearly all my shots won’t be “properly” lit. For me, I feel it’s more powerful, more realistic, to have light and shadow move in a natural way or often in a dynamic way. I’ll even work with high contrast light sometimes when I need texture to come out of something like a boring looking peanut butter cookie. So my point is this. I can’t follow the rules, nor would I want to. Even if my work isn't sometimes well liked. Although often, the opposite happens and I catch the attention of people who can use my work. This is what I challenge you food photographers and budding food photographers to do. I want you to confront convention. I want you to think, to explore, and to step outside of these ridged regulations sometimes. I think when we’re able to accept food photography as more of a free art than an exact set of rules to be religiously followed, then our medium will be brought to new levels not experienced before. Think of it this way, even Ansel Adams had to shoot his own way as he recreated the rules. I’m not afraid to be me, and I want you to be brave and explore your own talent and style. Even if that means it takes awhile to catch on with everyone else. This isn’t saying you shouldn’t learn the rules of photography if you don’t know them. Great artists start with the classics. But once you understand them, you’re almost always better off starting trends and breaking new ground. Who wants to be on the tail end of an outgoing trend anyway? Not me, no thank-you. "This classic French soup made with fresh peas and shallots comes together in a snap!" 1. Melt the butter in a heavy-bottomed saucepan over medium heat. Cook the shallots until soft and translucent, about 3 minutes. Pour in the water and peas, season to taste with salt and pepper. Increase the heat to medium-high, bring to a boil, then reduce heat to low, cover, and simmer until the peas are tender, 12 to 18 minutes. 2. 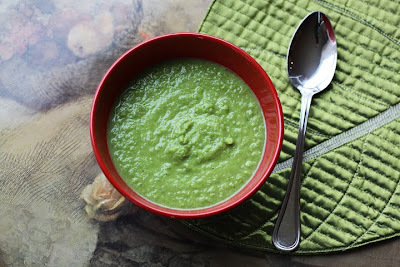 Puree the peas in a blender or food processor in batches. Strain back into the saucepan, stir in the cream if using, and reheat. Season to taste with salt and pepper before serving. Serves 4. Ready in 17 minutes. Submitted by Lizz C. to Allrecipes.com. Photograph by Laura Flowers. This is really good stuff - the photo advice and the recipe. Personally, I needed to hear it was OK to step out of the norm a bit (not to sound all insecure or anything) - but when you're still learning something new you think you have to follow the rules to be good at it. A sincere thanks. Great post Laura, thank you for sharing, not only your pictures but also a little bit about yourself. I am looking forward to meet you. boring and like a bad tv show. Shadows give depth and add interest. They become another character in the shot. I am new at this food business and just finding my way. The more I do what I want and less what I think others want... the better the photo.... that and holding still and I'm good to go! Great post and nummy soup photo! Laura, Thanks for the pep talk, I needed that:) I have been lazy and have not even learned what all the buttons on my camera are for! I really need to do a tutorial! Your photography is awesome! You are right...though science is involved in photography, the end result is a product of artistic self-expression by the photographer. The green could not be more inviting! !Just luscious. Seriously, though, I've noticed how I try to make my photos look like yours and other great food photographers out there, even when they go against my own "voice" or style. Also, I follow others' style to seek approval from foodgawker or tastespotting, for example, as well. So, sometimes it is hard to find your style when they're are so many other compelling reasons to "follow the herd". I will work harder at developing my own style, though. I will take your advice and gulp hard. :D Thank you. I agree, Laura. As a painter I wanted to learn the rules first so I'd know when to break them! Some rules are more interesting when they are just twisted slightly. My rule...master a craft and then just turn yourself loose. Dance into the wind and alter the steps to fit your own! I would love that soup right now Laura... sprinkling and a bit damp here. That's exactly the way I like to prepare 'fresh' pea soup (with frozen.) Soo good! I love all of your pictures. You have an artist's eye. Everytime I take my own pictures I wish for a real photographer to be there beside me telling me what to do. Thanks for the tip on shadows and being your own self. Your food photos ALWAYS look fantastic to me. I often assume that other bloggers (ok...you specifically because you are so good at it) are saying "is that the best you can do?" I don't shoot for shadows/non-shadows, I TRY for photos that make something look tasty...well, at least thats my aim. I don't have any photography training whatsoever, but your thoughts sound absolutely true to me - I think the overall impression is much more important than the rules. And your "dramatic" peanut butter cookies shot is a very good example :-). Also, the recipe sounds absolutely wonderful, both simple and tasty, and I finally know what to do with that huge bag of frozen peas :-). Thanks so much! Thank you for posting this! I have been turned down several times on some of my food photography at a food site for bloggers due to my inability to "step outside the box". They just keep refering to the problem as lighting issues. Well, I'm with you...I like my lighting issues! And I like your beautiful soup. Oooh - now I can't wait for fresh peas this spring! Hi Everyone. I’m glad this helps you some. And Coleen, you have it all upside down. I’ve never once thought badly of your work. The opposite is true though, you’ll use something interesting in your shots, or use an angle I haven’t tried and it gives me inspiration. I learn more from you I think than you do from me. Maybe it's a good thing that I don't have any formal training in food photography. I just shoot what looks good to my eye. ciao Laura!! la zuppa di piselli deve essere davvero buona! Io non sono brava in fotografia...ma adoro cucinare...ma mio marito sta cercando un buon modello di macchina fotografica per valorizzare di più i piatti! Oh the color of this soup is just amazing! Looks so healthy and appetizing. I looooove your photography. Continue to go with your heart because I think you do amazing things. I totally agree with you. I take pictures of my food and post them on flickr and someone told me that my photos are all underexposed! In a small way it there is a discrepancy between my screen and the internet but I actually do like to capture the mood in my kitchen the day I took the photo, whether it was overcast or late in the day. Rules are sometimes made to be broken! Thanks for speaking out about photography. As a beginner, I learn try to from more experienced photographers, like you. All lesson are relevant, but not all styles fit me. The pea soup looks delish. Amen sista! I say bring on the shadows. After reading so many condemning posts from supposedly superior bloggers creating rules and passing judgment it is refreshing to hear someone say you can break those rules. You SHOULD break those rules! Thanks for stopping by and leaving such a nice comment about my "Happy List" - not too sappy? Not Afraid to be me- Great title for one of my food poems! Love it...I ask hubby if I could make pea soup last week. I have VA ham and peas, but he said "uh, well..." too much hesitation, but too bad honey, you want me, you live, you eat, pea soup, LOL! Man, girl have I been busy! Phew! I am looking forward to meeting and relaxing with some good blog foodie friends! Thanks so much for this inspiring post. As a wanna-be food photographer with minimal resources, I'm always looking at magazine photos and admiring the lighting techniques. It's good to hear a professional who doesn't feel the need to conform. Thank you!!! I love pea soup. Gorgeous. Music to my ears. I don't like rules, LOL! And being me, is the only person I can be!! Love the advice. Fantastic advice, Laura! I loved reading your thoughts here. I know there are "rules" in food photography and just photography in general. I like to be aware of these but I also just do what I like. I love experimenting because I enjoy learning. And, photography, like any art, really is subjective in the end. So, I usually just end up doing what makes me happy. A thicker version of this also makes a nice little side dish for poultry. I like the little bit of cream you add at the end. Makes it all the more luxurious. LOL--I don't know any of the rules so I guess I should start with learning them first! And your shot is awesome, as usual. Guess I'm a fan of individual style, even if I wasn't aware! I like the shadows.. and i feel everyone has their own style, so be it. I share your thoughts. I am a hobbyist and I enjoy photographing food. I research on-line materials and resources to improve my photography. From what I have read so far, it seemed like shadows are a no-no in most types of photography. I can understand not wanting harsh shadows as a result of direct use of flash. But it seemed like shadows aren't acceptable when it comes to food photography. I don't have the budget for a sophisticated studio lighting set-up so I am still experimenting on ways to eliminate shadows as much as possible in food photography. I like your shot of the pea soup. Image looks fine to me. Thank-you. I know I must not be alone. I keep telling everyone to find themselves and not always follow others. I think food photography is going to be more amazing than we ever would have guessed it could be when this happens.